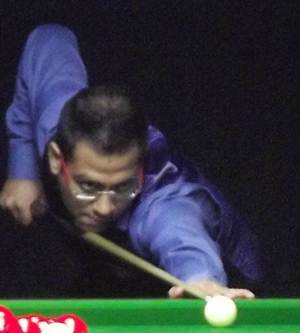 Rupesh Shah caused a major upset at the World Billiards Championship when he defeated seven-time World champion and compatriot Geet Sethi in the 'Long up' format and advanced into the pre-quarters of the event, in Leeds, on Tuesday. Shah won 750-536 and was joined by four other Indians in the round of 16. From the traditional time format, this year championship saw the introduction of 'Long up' format, with 400 points for the league stages, 500 for rounds of 32, 750 for last 16 and 1000 for quarters. Points Format finalist Alok Kumar overwhelmed country-mate Dhruv Sitwala 750-458 to progress into the next round. While B Bhaskar defeated Robert Hall of England 750-536, Sourav Kothari and Ashok Shandilya downed fellow-nationals Arun Agrawal (750–448) and Dhvaj Haria (750–609). Rupesh Shah bt Geet Sethi 750-536, Alok Kumar bt Dhruv Sitwala 750-458, B Bhaskar bt Robert Hall (Eng) 750-536, Sourav Kothari bt Arun Agrawal 750–448, Ashok Shandilya bt Dhvaj Haria 750–609.